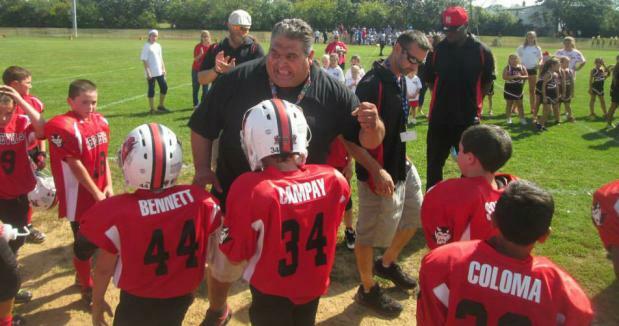 I get Dad’s that call me or text me and tell me they want their son’s to be safe, but they are afraid they will get behind if they don’t put their 8 to 10 yr old in Youth Tackle Football? Quite the contrary as Flag, Flex or 7on7 now have over 4 million active players in ages 6 to 12 and that is substantially more then Youth Tackle. In fact, Youth Tackle participation numbers have dropped for the 6th consecutive year. 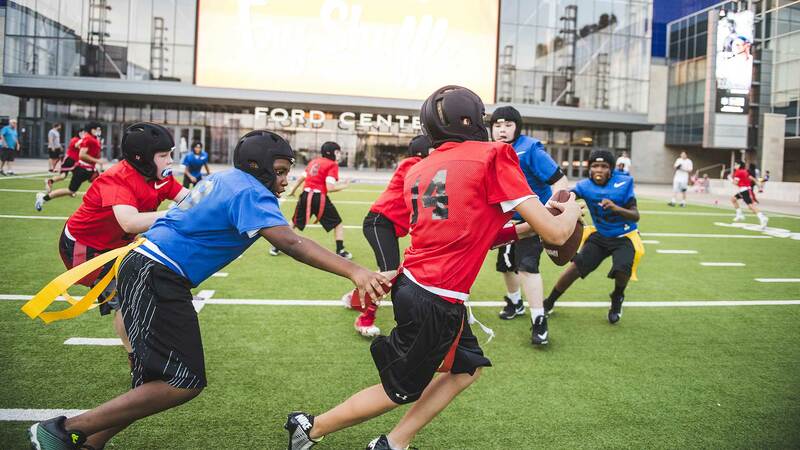 The NFL has taken note and you can see their involvment with growing flag leagues around the country to keep players involved with the game of Football. In fact they are being very progressive in trying to protect players and installed new rules this season on kickoffs, targeting with the head and better protection of the QB. Sorry 3 pt stance but your about to go away too in the next few years. After two weeks in the season people were calling the game soft and nothing but flag football but here we are 85 percent complete with the 2018 Season and guess what? Viewership is up, ratings are up and low and behold scoring is up across the board! Less head trauma, less concussions, less targeting of defenseless receivers = more scoring! Was it really that hard to figure out? Flag, Flex, 7on7 all encourage more scoring and people want to play and well its just fun. Plenty of time for the Youth player to learn full contact in MS & HS. The game has changed, and aspects of High School & College Offenses schemes have come into the NFL. The game is spread out, fast paced and incorporates a lot of passing. Do you really want to have great young QB prospects like Pat Mahomes get drilled in the head on the blind side and have to watch his backup for remainder of the Season grind out 13-10 games or is it fun like last Monday night when he gets in a 50 plus shootout with the Rams and the game goes down to who has the last possession? The game of Football is becoming safer on all levels except? The game continues to change and evolve towards safety in football except for one area and that is Youth "select" Tackle Football. And while for the most part the Coaching is not really select at all nor do they adhere to any background screenings. It seems that its only really called select so they can add anyone they wish to their roster from any part of town and not have to be troubled with a true draft process where they maybe would get out coached schematics wise or have to teach skills or fundamentals. It seems that some (not all) of these Coaches are involved with Youth Sports only to chase trophies or silly titles or rings that mean zero for High School or College Coaches. Not one High School or College Coach has ever asked an incoming Freshmen what his peewee record was? Am I against tackle football? Nope, not at all. I love it but certainly think there is a better way to teach younger players then what we have currently been doing. 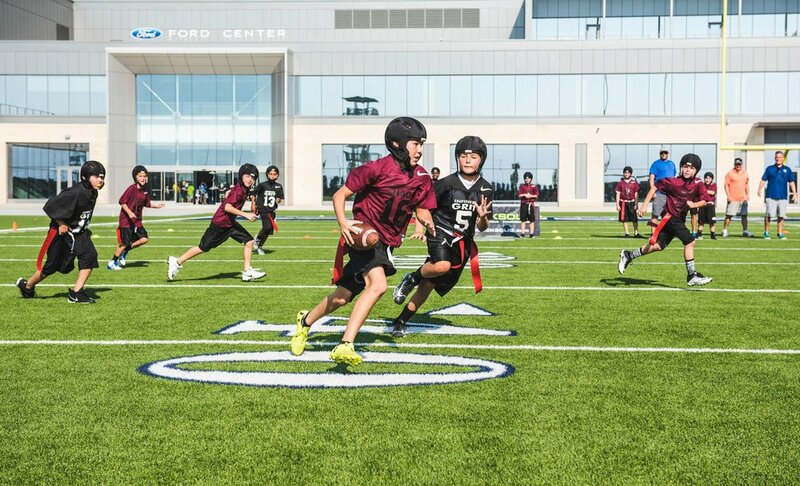 So what I really like what Rec Tackle Leagues are doing with Youth Football and that is keeping the entire Season to 90 days or less, mandating that you can only have 3 or less padded events per week that includes practices and games. They are essentially doing what the NFL, College & High Schools have all done and limit the amount of full contact. If it's not needed at the upper levels why would you allow Youth "Select Coaches" to keep your children in full contact tackle 7 to 8 months out of the Year? Lets see I think I saw this year where 8U & 10U players needed pre season camp, training camp, 3 to 4 scrimmage games, 2 to 3 pre season Bowl games, 2 pre season tournaments, regular season, post season playoffs etc etc etc. Then you would think its done but we haven't even gotten to the pay for play "all-star" games. You can play in as many of these as you wish as long as you can pay. Then don't forget the pseudo Exposure Camps or Showcase Games. Of course these are pay for play as well and fully padded. By the time that's over its almost time to start pre season camp again! Flex Football was created because of what was happening in Youth Football especially "select". In Youth Football there was not a bridge game designed that could take a younger youth player from a introduction game of 5on5 non contact flag football all the way to a 11-man tackle full contact game on a hundred yard field? That is what we are doing with Flex, taking that first year player, taking that player moving up from non contact flag and introducing semi or limited contact and working on skills, fundamentals, leverage with your hands and your feet without the unnecessary and pointless banging of skulls. If you're a parent of a player age 6 to 12 and your "Coach" has your son in full pads over 4 months of the Year you really need to reevaluate that Coaching Staff. Don't fall for the "exposure" word that these "Coaches" like to hold over you to keep your star player. There is no College looking at your 6 to 12 yr old yet. 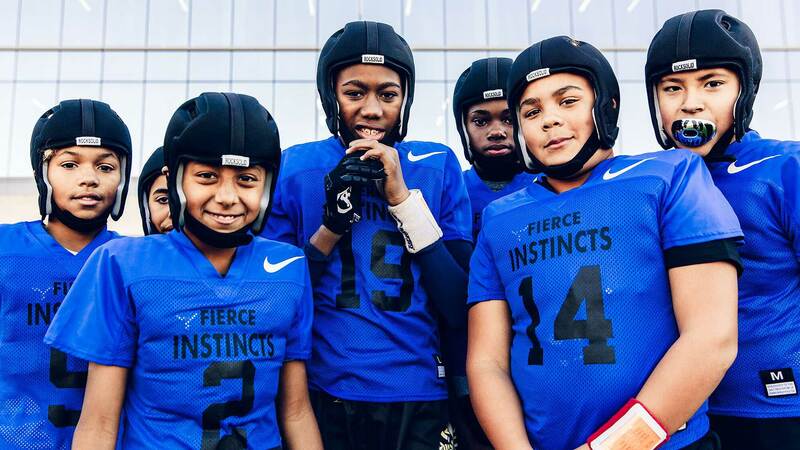 What Youth Sports are on the rise and why isn't Football one of them? Read another article on Youth Sports and player participation this time at https://www.leaguenetwork.com/which-youth-sports-are-on-the-rise/ They mentioned 3 sports on the rise and I will tell you why the number one is having a big inpact and the one simple thing they did 8 years ago. So they mentioned Hockey, LaCrosse & Gymnastics. I don't know much about Gymnastics but I think LaCrosse looks like a great game that is fast paced with pretty constant movement (unlike Youth Tackle) which is tends to be slow, tedious and compressed. But Ice Hockey was the number one in terms of recent growth with 64% growth in last 10 years. Why? Well here is the very simple reason you have huge growth in Ice Hockey, ten years ago Youth Hockey had declining numbers in new youth players so USA Hockey steps forward and institutes that body checking will not be allowed until Bantam Division which is 13-14 yrs old. That's it! Pretty simple. Was it simply a way to decrease injury and potential concussions? Yes it was but that was secondary to what USA Hockey said and I quote "It's a skill development initiative first," based on USA Hockey's research that bodychecking at the Pee Wee level (11-12 year olds and younger) was significantly distracting players from improving their skills at a critical time in their development, with players either too focused on hitting or trying to avoid a hit. That's it? So by eliminating the body check before age 13 you decrease injury, concussions and players develop skills faster toward their respective positions. It's pretty much spot on with what we are trying to do with Flex Football around the Country. Introduce youth players to football with semi contact, keep the head out of the game until Middle School, develop the skills to play modern football in space to progress towards High School career and potentially beyond. Flex is dynamic in its benefits and is a Spring extension for tackle football leagues. Flex gives players and teams a platform to develop their skills in a non-tackle environment with low impact on the body. 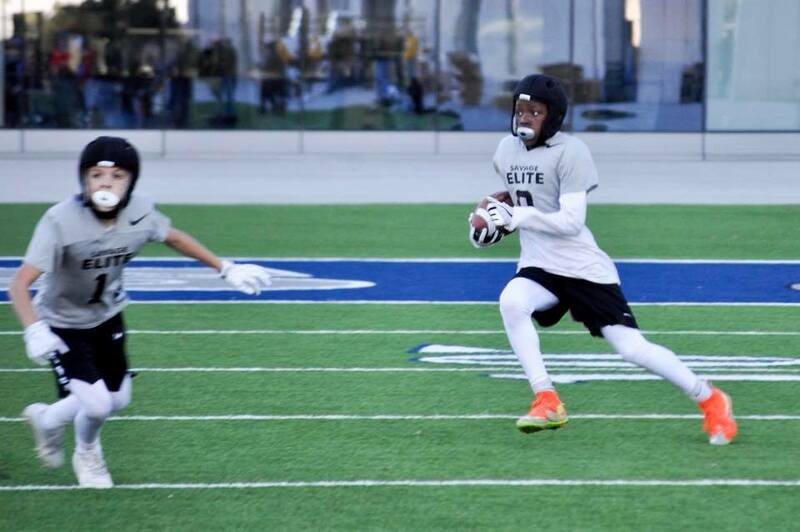 Additionally, Flex is easily integrated into fall leagues at the younger age groups, resulting in better trained and more confident tackle football players. Tackle is undoubtedly viewed as the top of the football pyramid. At Flex, our goal wasn't to change tackle, but to make it better. The obvious problem with natural progression in football is the gap between non-contact and full-contact styles of play. As a result of this gap — where skill-building and preparation should occur — less kids are merging into tackle, they're dropping off, or finding other sports. With the creation of Flex Football, parents can have confidence in their child’s readiness to safely step into full-contact. Flex introduces limited-contact for the first time in the form of “hands first” blocking, and with its unique and proprietary game play, creates an atmosphere of playing in "open space" and fast-paced environment that's closer to the modern tackle game. Is your Coach about the development and skills of each player or is he more concerned with his Youth Football record and status? I get calls everyday do we have Youth Coaches that scream at kids and make them do ridiculous non football related punishment exercises? You know things like monkey rolls, bear crawls, roll the whole field etc etc. Just time waste and have nothing to do with Football. My answer is no, we are attempting to gather the best set of Youth Coaches we can that are actually interested in teaching fundamentals, character and team and individual skills. Make no mistake that it is competitive and each Coach wants to win but I can assure you we will not have any issues with Coaches or parents misbehaving during or after our Football games. The game and culture has to change and it starts at the top in each Org and should filter down to the Coaches & parents. Two weeks ago a University of Maryland player dies from an on field workout. A conditioning test, shouldn't be a big deal and for the most part something every team does. As we find out more, the Coach is suspended and now we find out from current and former players that they have a "toxic culture" from Coach to Player. There is a coaching environment based on fear and intimidation. Constant verbal abuse and the belittling, humiliation and embarrassment of players is common? So it goes from College to HS and surprise this gets filtered down to the wannabe Youth Tackle Coach? The one that probably couldn't do an up down, bear crawl or monkey roll if he had to but is the one in charge of directing your son in a 10 and under practice screaming about lets hit, lets be physical blah blah. As parents you should do your due diligence on your players Coach and feel him out to determine is he in it to really volunteer to help kids and be a positive person in your son's life of is he just another looking to enhance his ego by chasing trophies, rings and false titles at the expense of your son. 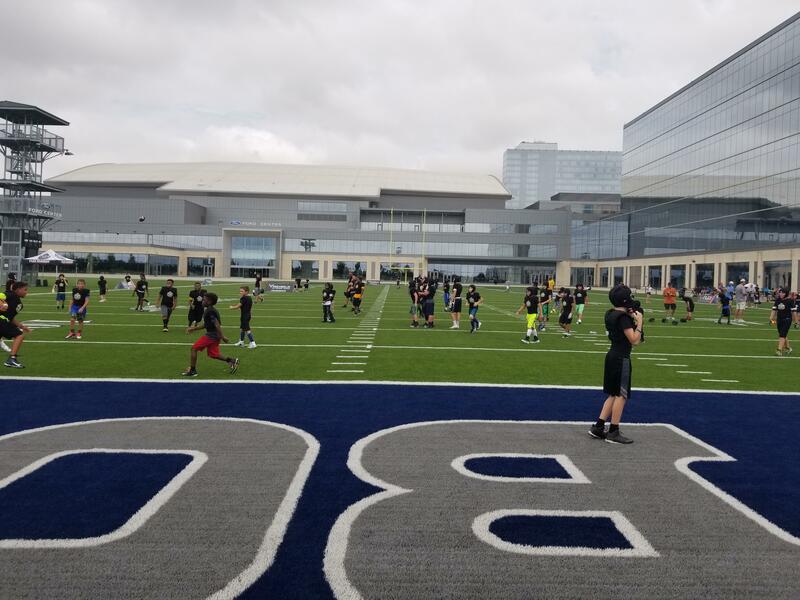 I was proud and slightly amazed by the turnout yesterday in Frisco for our first ever Flex Academy Camp. Our Season is still a month away and we had 139 Youth athletes come spend 3 hours with us and get some great instruction and get ready for our Fall Season. There is a huge demand for our game for first year players, players moving up from flag football and the tackle player that just isn't getting quality reps on his tackle team. The thing about Flex Football and the equipment manufactures of our Game Rocksolid is they just do everything right and they get the overall big picture. They are all ex NFL players, they took the NFL concepts of non padded days that create a high intensity and faced paced way of playing football that doesn't require taking people to the ground or any head impact hits at any position. That overall big picture should be to make the Youth game fun, provide safe instruction and develop skills in each player so they will continue in the game of Football through MS & HS. Unfortunately Youth Tackle Football is just a mess, participation in Youth Tackle continues to decline each and every year and that is attributed to several things including poor leadership from Org or from Coaches that can't understand that the NFL, College & High School all have rules and regulations regarding the number of contact days but somehow that should not apply to 6 to 12 yr olds in their Youth Tackle Org? Especially the "Select" group, you know the ones that preach the word exposure to all their parents. The exposure group are now keeping kids in pads 8 to 9 months out of the year? Add to the mix that we still have a mess in the NFL with Head trauma, concussion talk and CTE that is also a huge concern for parents with their kids as we just know so much more now then we did 10 to 20 years ago. That is the sole reason that this game was designed as in the past there was a huge discrepancy that existed between non contact 5on5 flag football on a baby size field width of 28 yards and then having to go to right to a Youth 11 man Tackle Org. The was no Bridge from one to the other. Every other Major Youth Sport has that bridge as baseball goes from Tball to coach pitch to kid pitch and the mound and the bases get further with each move. In Hoop you start out on a 7 or 8 ft high basket and have to play man, then you progress to 9 ft and then finally 10 ft and zones and presses etc. Football didn't have that bridge until now. We have taken the best of Flag, the best of 7on7 and the best of Tackle and created a great game in Flex Football that has contact but does not allow tackling or head hits but also is a great game to developing team cohesion and individual skills in a safe environment. Want to play Tackle, great, make sure you get your player with a Coach that actually cares about the well being of all the players and just not using kids for social status or trying to chase rings, trophies and bogus titles of bowl games, all star games & exposure camps. The contact, what kind, how much? I talk about the contact everyday regarding Flex Football. It’s all good and I try to make it as easy to understand as possible. Is there more contact then flag? Yes there is, is there more contact then tackle football? No way, we have eliminated the head from the game. Our game is like backyard football as we allow semi contact, that is why we wear soft shell padding of helmets and shoulder pads as we allow blocking above the waist with the hands. Strictly no head involved in a block or a tackle period. So contact allowed on offense in the sense of blocking D-linemen, RB’s blocking LB’s on blitz and WR blocking DB’s on running plays! Contact allowed on the defensive side is DE’s work on getting off a block of a Tackle or perfecting swim move on pass rush. DB’s can jam WR for up to 5 yards on passing plays. 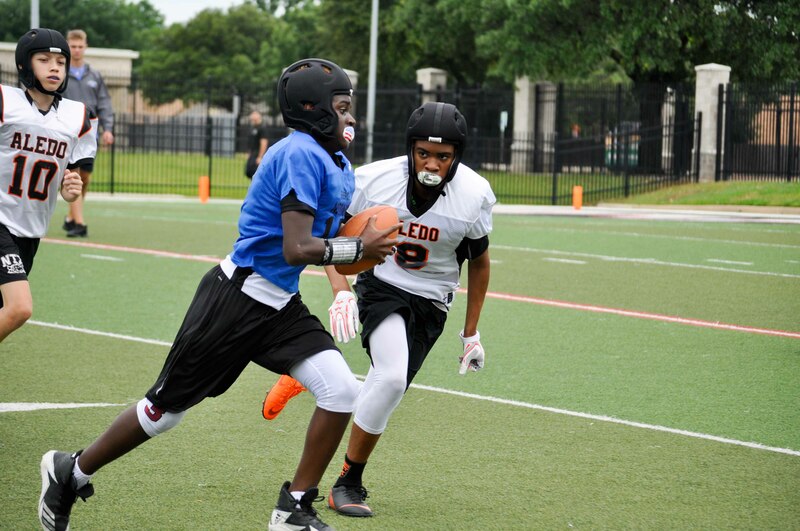 I love the picture above of the Cedar Hill Longhorns who came out and played with us a few months ago and this picture of what the QB sees in the pocket. Both of his Offensive Tackles are working on pass blocking and if he wants to complete a pass he will need to step up in pocket as WR’s get off the press coverage from defenders. You see both Safeties over the top at approx the hash. It’s a great game and we are pretty confident that your player, coaches & parents are going to love it too! I had the pleasure to meet a group from Ft Worth today that were truly in it for the right reasons. There not in pads for 9 months out of the year, they just go from season to season with well rounded athletes. Football, Basketball, Baseball, Vacation & repeat, just like it used to be. A true Rec group that has ran Flag Football for a long time but had seen one of our Flex Football videos, did their due diligence and decided to come be a part of our Fall League. In return we have agreed to put a Spring League into there area of Ft Worth come Spring of 2019. Flex Football is truly a great opportunity for kids to play football with a certified and background checked Coach, learn the game, learn the fundamentals and enhance skill work by position. ©2019 American Flex Football / SportsEngine. All Rights Reserved.